Two greening programmes have been facilitated by the directorate: The Outreach Greening Programme and the Greening of the Nation Project. The former was established in 1997 at the Kirstenbosch NBG and over the subsequent years, started being offered at the Biodiversity Education Centres in the other Gardens. The latter was a national project funded through the Department of Environmental Affairs as part of its Expanded Public Works Programme – the last phase of this project was completed in April 2014. Both aim to build capacity within historically disadvantaged school and community groups to plan, develop and maintain indigenous gardens. 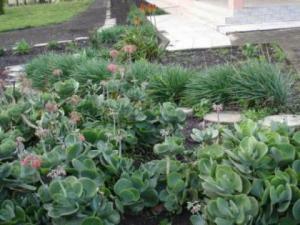 The Outreach Greening Programme is facilitated using sponsorship from a variety of funders. Schools and community groups apply and are selected to participate; the selected schools stay on the programme for a minimum of three years; the selected community groups for one year. Through a series of workshops during the first year of the programme, participants learn about various aspects of garden design, planting, maintenance and plant propagation. After each workshop, the participants immediately implement what they have learnt, thereby following a step-by-step process of developing their own indigenous garden; the funding provides all of the resources (compost, plants, mulch and a tool kit). 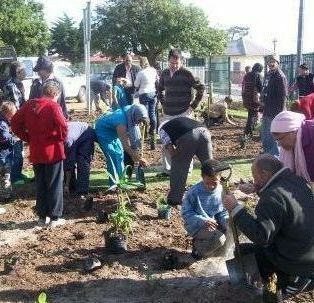 In the second and third years of the programme, the participants are given support to extend their gardens, start to use them as teaching and learning resources and, by the end of the third year, arrange “Open Day” events at which the gardens are officially handed over to the schools and communities. This model has successfully ensured the sustainability of the greening projects. The programme is successful from various perspectives. The empowering nature of the greening model builds self-confidence in the participants that enables them to embark on numerous additional environmental projects that further support teaching and learning while promoting ecological awareness. The gardens not only improve the aesthetics of school grounds and community open spaces but also contribute to a positive teaching-and-learning ethos in schools as well as much-needed spiritual upliftment in the marginalised communities. Furthermore, the gardens contribute in a significant way to the conservation of biodiversity in urban settings in that they could be viewed as miniature nature reserves providing food, shelter and breeding places for many small animals such as insects, birds, reptiles and rodents. Although one could argue that the gardens are ‘islands of biodiversity’, they do appear to be operating as ‘stepping stones’ or ‘refuelling stations’ allowing certain species to move between larger natural areas and therefore, helping to conserve the genetic diversity of species.